Whether you’re missing a single tooth or an entire arch, it’s important to have those replaced to avoid detrimental damage to your mouth. Dental implants are the superior option for tooth replacement that you’ve been dreaming of. So how do they work? Implant posts are placed beneath your gum to stand in place of the structure of you missing tooth’s root. After that, your replacement tooth or teeth are attached, making a sturdy and natural permanent stand-in. They help promote bone tissue growth, unlike dentures, and rather than restoring just the part of the tooth you can see, implants replace the entire structure. It’s no surprise that they can drastically improve your quality of life and give you significantly less to worry about. But one thing to keep in mind is that in order to be an ideal candidate for them, you must have exceptional gum and bone health to support the implant posts. The largest advantage of getting dental implants is that you won’t have to stop your day every few hours to maintain your dentures. Your quality of life will improve drastically when you make the decision to get them. Not only will it benefit you physically by supporting bone growth and keeping your face from drooping, but you’ll be able to let go of all the small inconveniences that dentures add to your life. In order to get a precise estimate, you will need to schedule a consultation appointment with your dentist. Depending on how many teeth you’ll need to be replaced, the price can vary greatly. 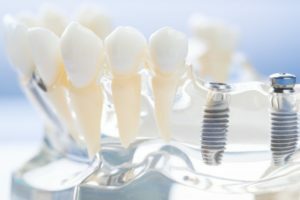 Typically, implants aren’t covered by dental insurance, although there is a possibility that your medical insurance may, depending on the cause of your tooth loss and your insurance plan. Dental implants are practically identical to upkeep as your regular teeth. It’s important to brush twice a day, floss, and use mouth rinse to kill bacteria. They cannot be removed, so you don’t have to worry about soaking or taking them out after eating. Regular dentist checkups are also the key to maintaining healthy implants and gums. You don’t have to put yourself through all the stress and inconvenience of a purely aesthetic solution like dentures anymore. Instead, improve your quality of life with dental implants! Take the first step by contacting your dentist to schedule an appointment today. Dr. Philip Batson has been serving his hometown of Columbia for years. To him, dentistry isn’t simply a profession, it’s a family tradition of attentive and individualized patient care. As the President of the Missouri Academy of General Dentistry, Dr. Batson focuses on continuous learning so that he can give his patients the most up-to-date care. For any questions or to schedule an appointment, visit our website or contact us at 573-721-9039.